Jonathan Hebditch was a keen listener of NECR. But critics have countered it doesn’t go far enough and have argued that any future publicly-owned buses would be “hamstrung” by exiting private operators. As part of the proposed Transport Bill, councils will have new powers to run bus services, allowing for the introduction of controversial London-style low emission zones where motorists would potentially have to pay to drive in certain parts of cities. Consultation is ongoing and it is expected to pass through parliament after the summer recess. 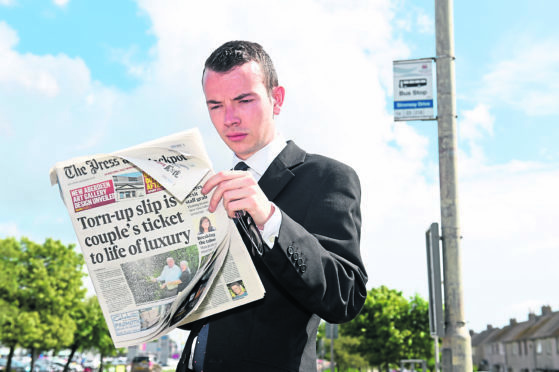 In June, talks between Aberdeen City Council and First Bus began with the local authority understood to be looking to run the city’s buses in the future. First Bus took over Aberdeen services in 1989, but setting up a council-run bus company, similar to the city’s previous Grampian buses, was at the heart of Aberdeen Labour’s manifesto during last year’s local elections. However, First poured cold water on the idea, insisting they had no interest in selling. Few public services now operate in Scotland with the exception of the likes of Edinburgh’s Lothian buses. Government chiefs, councils and environmentalists have urged people to turn to buses and other forms of public transport to reduce emissions. The Press and Journal decided to test how easy it was taking the bus in comparison to driving to work – and our findings can be seen here. Buses have proved by far the most popular means of public transport in Scotland. 524 million public transport journeys were made in 2016-17 – 75% by bus (393 million passenger journeys). A Scottish government spokesman said Holyrood is continuing to spend over £250million a year to support the bus industry, “allowing operators to keep fares at affordable levels and provide free bus travel to older and disabled passengers”. Scottish councils spent over £50m on services in 2016-17. But Aberdeen City Council transport spokesman Ross Grant said the draft bill didn’t go far enough and claimed amendments were needed. He added: “It’s a matter of real frustration as what we have is the Scottish Government totally reneging on their commitment to grant local authorities the powers to look at the feasibility of operating municipal services. “As an administration, we have done as much as we can to state the council’s position, but unless the bill is amended in parliament, councils will be left hamstrung and at the mercy of existing public transport operators, picking and choosing the most profitable services. “In Aberdeen’s interest, we have consistently worked positively and collaboratively with First and Stagecoach in Aberdeen to try and make the improvements that will encourage people to take the leap onto the bus. A Scottish Government spokesman confirmed the bill would give councils new powers. He said: “The Transport (Scotland) Bill will support local authorities to meet local needs, whether they wish to pursue partnership working, local franchising, or running their own buses where appropriate. “Local authorities can already run their own services in some limited circumstances, as some do. The Bill extends these powers. “The bill allows local authorities to deliver bus services which are not being offered by commercial companies. “They can do this either directly themselves or through a council-owned company to address gaps in the services provided in their local network. As a girl who grew up in the Aberdeenshire countryside I never thought it would be practical to take the bus to work. Living in the outskirts of Hatton of Fintray there are very few opportunities to travel by public transport. It’s a 10 minute drive to Blackburn to catch the 37 Stagecoach bus into work. As someone who loves driving, however, I feel shocked to admit that commuting to work by bus was easier than I anticipated. The contactless payment system is excellent, the chance to look around is great and the time to do extra little bits and pieces while travelling was enjoyable. But the novelty wore off quickly. Perks such as the Stagecoach app and website are great when they’re accurate. But when running early the driver stops for a prolonged period to stick to the timetable. When they’re running late, it’s a case of foot to the floor for a few stops until those minutes are caught up. The app was not updated regularly enough to be reliable. It also made me obsess over minutes, with my heart rate peaking each time the online was inaccurate. On the bus I was shocked that no one wore a seatbelt, despite multiple signs. A man turned to look at me as if I had broken the rules of the bus as I clicked mine into place one morning. It did not surprise me, however, that people hate sitting next to others. It’s another unspoken rule not to sit next to someone if there is a spare pair of seats elsewhere. One bloke even took up four seats, resting his legs on the backwards facing two. Money-wise, the bus cost me more than driving – my trusty Micra takes £35 to fill and that lasts a fortnight-and-a-half. Each day’s adult bus return ticket costs £6.40 – amounting to £32 a week, though luckily I’m still a student so it’s slightly less. And my journey time nearly doubled when taking the bus as, on average, it took almost an hour whereas driving usually took around 25 minutes. Overall then, the bus cost more, the stress of planning each journey to the minute wasn’t worth the views and I’m not yet accustomed to bus etiquette. Bus services are definitely more efficient than I expected but for the price I’m not convinced it beats the freedom of a car. As somebody who lives in Aberdeen city centre, I approached my week of taking the bus with some excitement. I was looking forward to the relaxing journey to work, allowing me to read my newspaper in the morning before arriving at work. And, for the most part, my expectations were satisfied. A short walk from my flat on Marischal Street to the bus stop on Union Street felt healthier than my usual half-awake stumble into the car every morning. The buses, run by First, were clean, punctual and modern. And unlike my days at university, you are no longer required to buy needless packets of chewing gum to break your notes and give the driver the exact change – they now have contactless technology. However, driving proved to come in at less than half the cost. My £4 a day spent on the bus over five days resulted in me forking out £20 for my travel for the week. The next week I put £12 of fuel into my one-litre Kia Picanto and, even after my journeys around the city for a week, I still had petrol in the tank to last me into the next week. Perhaps my car is particularly fuel-efficient, but until taking the bus is as cost effective as driving, I cannot see a mass change in the habits of sceptical Aberdonians. The fares are the highest in Scotland and visitors from other parts of the country are regularly astounded by how much buses and taxis cost in the city. Council chiefs have been in talks to potentially take over First under a similar model to Edinburgh’s Lothian buses. But First chiefs have made it clear they are unwilling to sell.